Now that it’s over - and it was as soon as Matt Baggott abandoned his misconceived inept response - it’s time to try to make some sense of the three months. Of course the violence and chaos of those months whetted the appetite for rioting such as occurred in Glengormley and at the weekend in Shaftesbury Square/Sandy Row, but it’s of a different nature from the nightly manifestations from December. First, those so-called ‘fleg protests’ were pretty well confined to the greater Belfast area. Yes, there were guest appearances around places like Derry, Dungannon, Armagh and Ballymena, but they were flash-in-the-pan, copycat efforts. Secondly, we know that the worst violence was orchestrated by the UVF with its leading front men lamenting the poverty of loyalist districts. No-one in unionism pointed out that the poverty in most cases is caused by the UVF men themselves whose intimidation and protection rackets have driven business out of those very districts. The irony of UVF gangsters masquerading as community leaders over the past three years meeting the DUP leader in a #20 million community centre to whine ‘we get nathin’ is not lost on the public. All this we know, but it doesn’t explain the three months of pathetic, bedraggled frozen specimens trailing around the streets wrapped in flags and later displaying their illiteracy on Facebook and Twitter. Was it a coincidence it all began shortly after the belated release of the 2011 census figures in November? Figures which confirmed for even the dimmest unionist that the game is up. No, not that there’s going to be a united Ireland in 2016, but worse, much, much worse, that the Fenians are taking over Norn Irn, that the tragi-comic slogan of Norn Irn’s football fans, ‘our wee country.co.uk’ no longer applies. Horror of horrors, it’s not just Fenians at large, it’s Sinn Fein taking over the north and the vote to bring the flag flying in Belfast into line with elsewhere exemplified the change in the terms of trade in the city and the north as a whole. That’s why there wasn’t the same impetus behind protests in places like Ballymena. They haven’t spotted the change. Elsewhere, like Dungannon, it happened years ago. Truly the coat-trailing in and out of the now nationalist city, what unionists like to call the ‘capital of Northern Ireland’ (cos it’s a wee country you see) showed a lost tribe on the retreat. The aimless, pointless, leaderless protests, followed by a return walk to where they came from was like nothing so much as the native American trail of tears in the 1830s - a walk into history. Sadly just as tragi-comic was the performance of unionist political leaders, themselves just as inarticulate as the flag wavers. It was no use nationalists calling for leadership from these men. The unionist political leaders share the same sentiments as the flag wavers and are just as much at a loss to know what to do about unionists becoming a minority. Hence the stupidly inept unionist forum. Remember that? They’re prepared to do anything except admit the facts of reduced status and the need to manage a future of decline, to tell their voters that the social and economic bases for establishing the north as a unionist entity no longer exist. Now that the demographic coin has flipped, or perhaps more accurately the penny has finally dropped, were the street protests of December to March an indication that now, paradoxically, unionists have become the problem in the north, the place the British invented for them, rather than the nationalists who objected to the invention? Is the dilemma now to find the means to cope with a disaffected unionist minority who see Catholics a majority in every level of education and taking over the professions? 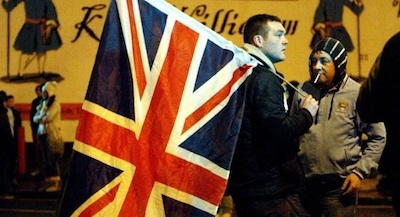 Were the protests an expression of shock and disbelief that Belfast really has a nationalist majority? Is the drive for so-called ‘unionist unity’ a political manifestation of the same problem? A forlorn attempt to stem the tide, to pretend for another few years?